It’s been a good long while since we’ve seen a genuine Nicolas Cage freak-out on-screen, a popular trait of the actor among audiences – and certainly meme-hungry online dwellers waiting for the next GIF he can all but gift-wrap for them – but for some reason over the last few years has been sorely missed from his more serious and less ambitious fare. 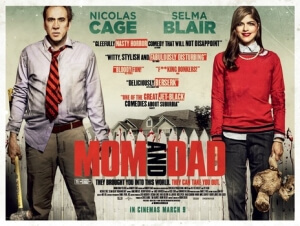 The good news is, Cage going completely bananas on-screen is by far the greatest part of his latest film Mom and Dad, directed by one-half of the Neveldine/Taylor directing team behind the Crank movies and had previously worked with Cage on Ghost Rider: Spirit of Vengeance. The bad news is, the rest of the movie is pretty incoherent and frustrating to get through just so we can see Cage do what he does best. In the past, Neveldine/Taylor’s movies have adopted a very peculiar filming style, one that goes for broke with the in-your-face wackiness that seems to add to the adrenaline (as in both Crank movies) as well as the complete and utter insanity. On his own, Brian Taylor retains most of that kinetic style so fans of those movies shouldn’t necessarily be concerned that Mark Neveldine isn’t involved with this movie, but those who have found that over-the-top approach quite tough to stomach – and I’ll admit, I’m not a huge fan of this particular style either – will find this a little tough to get through. The dizzying and rocky filmmaking goes right along with the nasty and threatening tone it establishes even before the phenomena hits the area, with most of the adult characters acting very childish and self-absorbed, which the kids can be to but with them it’s more believable because they’re young, and if this is satire it doesn’t work, primarily due to how nothing like this could ever exist in the real world because it’s so cartoonish and overdone. The phenomena itself, which is basically the same thing that Samuel L. Jackson used to get everyone to go at each other in the first Kingsman movie, and the attempted explanations behind it – though we are never given a straight answer as to who or what is causing it – doesn’t make much sense either, because at first it establishes that the affected parents only attack their own children and ignore the others, but later Cage attacks another young person who is definitely not their offspring and who just happens to be in the way. It’s not only inconsistent, but unnecessary; the idea of a mother and father suddenly wanting to kill their children is all you need, and the fact that there is something much bigger going on around them kind of ruins the exclusivity of it, and it’s not as scary by the time Cage and Blair suddenly turn psychotic because we’ve seen many other parents do terrible things to their own kids by that point. It’s all worth it, however, because we get to see Nicolas Cage completely lose his goddamn mind, and just like any other over-the-top Cage performance – see Face/Off, The Wicker Man, Con Air, The Rock, Bad Lieutenant: Port of Call New Orleans… in fact, pretty much most of Cage’s filmography pre-2009 – it’s an absolute treat to witness. You get to see him lunge at his kids like he’s in 28 Days Later, smash in the windows of his car just to get at his son, and in one instant classic moment for the Cage fans, destroying a pool table while shouting the words to the hokey cokey, just to name a few. Where this Nicolas Cage has been all these years is beyond a mystery, but it’s so great to see that he’s still got that manic magic about him. Really, that’s the one thing that prevents Mom and Dad from being completely unwatchable; everything else is pretty rough and not very pleasant viewing material, even when you’re familiar with this kind of filmmaking style. At the very least, it shows that Crazy Nicolas Cage is still a very real possibility in movies. Mom and Dad is a mostly unpleasant and incoherent movie to get through if you’re not already a fan of this filmmaking style, although it’s great to see a crazy Nicolas Cage performance on our screens once more.